Chestnut pond is now full, and I've built up the banks on Horseshoe pond and adjusted the sink area to make the pond easier to use, I expect an increase in capacity of atleast 30% from the bank work, and it may be more like 50%. This is just getting the pond to where we'd originally intended it to be - we just ran out of time last year to fix it up. 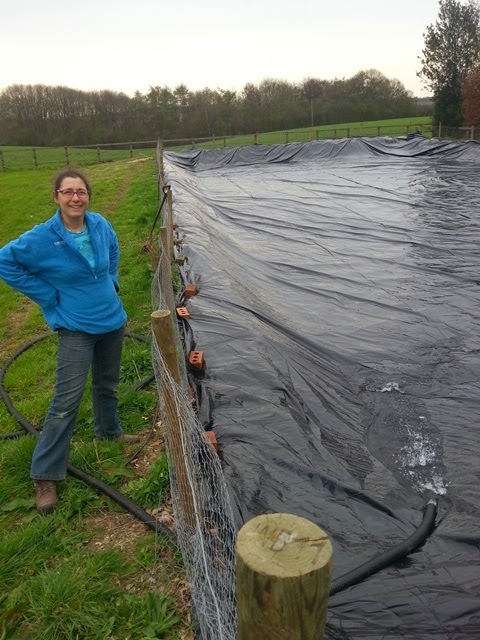 The proof will be in the pudding though, and I today Amanda and I lined the pond, netted it and started it filling by pumping water from Chestnut pond. Things never go exactly as you intend them to - sometimes when we line the pond there's a manufacturing glitch in the silage liner and a hole in the wrong place. Or, like this time - there was a complete failure in the manufacture. A 30m long liner was no more than 25m long when we rolled it out. that's a problem when the pond length is 28m. 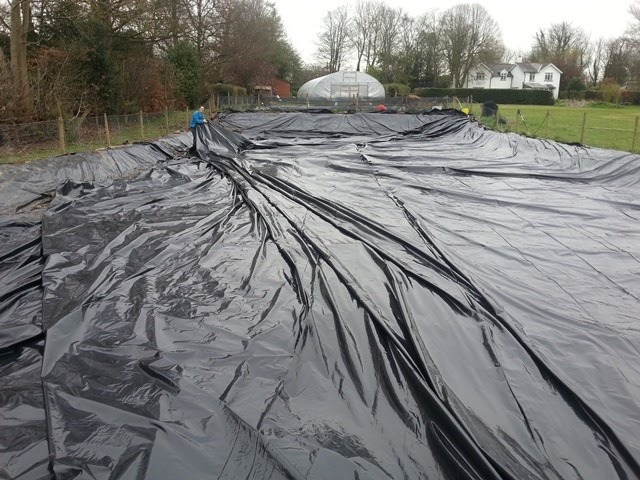 We rolled the liner back up, took it back to the shop and they kindly replaced it for another 30m liner which turned out to be 30m long - just the length we needed. All of a sudden, the breeding part seems not too far away. I was looking back on my blog post last year to see where I am relative to last spring - and I've got the ponds filling around a month earlier. Just need a nice warm, and sunny April to get the ponds going then May's when it all starts to get exciting. after all the hassle with the first liner being too small, running back to the shop, then re-doing much of the work a second time - it was once again very satisfying to reach the pond of filling the pond. Next week, I'm hoping to being some additional help in to make progress in the polytunnel. I need more filtration, and two additional tanks need installing. Another 12ft bestway vat, and a 1000l vortex that I'll be using as a small pond attached to the heated fry growing on area. I think it will come in handy when I want to separate fry later in the year - there may be some particularly good ones , or some with a special development interest and being able to keep them separate from the other will be useful. I'm starting to bring the temperature down on my QT tank so I can move the male showa's into my males tank - in preparation for spawning the showa female in around a month all being well.